Zuccardi Winery in Valle de Uco / Tom Hughes + Fernando Raganato + Eugenia Mora – Sig Nordal, Jr.
December 31, 2016 Sig Nordal, Jr.
From the architect. The plan to design a winery for top quality wines was developed in Paraje Altamira, in the district of San Carlos at 130 km to the south of Mendoza city. Located at 1100msnm, Paraje Altamira is surrounded by vineyards and it is placed in the heart of Valle de Uco at the foot of the Andes Mountains. The area, which has been recognized worldwide, is ideal for wine growing because of the spectacular natural setting. Within this context, wine tourism has gained great importance not only for the industry but also for its tourism. The spillover effect is that in some basic rural areas, new activities and infrastructure related to the wine industry have begun to emerge. Hotels, local gastronomy, real estate developments are exploring the limits of creativity to offer visitors new and original ways of exploring the fascinating world of wines and the virtues of the surrounding areas. The architectural proposal responds to two essential objectives: on the one hand, a building which is functional to the agronomical needs together with the enological aspect always following the strict technical and operational requirements that the process of high quality wine making demands. And on the other hand, the touristic aspect, where the visitor plays a leading role and together with the impressive landscape makes everything possible. The Zuccardi Winery itself is a tribute to the solemn and austere Andes Mountains, which define the weather and the soil of the region. The building emerges directly from the soil and becomes part of the mountain, seeking integration and visual balance which do not affect the landscape. From the productive point of view, the winery is designed on a strong axis which links all the operating areas of the winery. It is similar to a backbone which is repeated on the three levels. The basement holds the wine vats, the ground floor contains all the productive process and the lab, the administration area and the tanks gateways are on the first floor. The production system takes place through gravity. The grapes enter from the harvest area. Then, it follows a rigorous process of double selection. Next, it is deposited in big barrels that are raised and transported to the tank mouth to be deposited there. After that, the fermentation process starts. The process is distributed in a U shape and it is organized around a big central terrace which guarantees a comfortable and agile operation, safe from the rigorous weather conditions of the area. The winery is almost completely made in reinforced concrete in sight, exploring different finishes. Big slopes of hydro washed cyclopean (with great rocks) concrete, with local sand and gravel, emerge from the ground with a tectonic strength. Heavy and robust volumes look like bodies emerging from the surface, showing the features of the ground as a way to express its own identity. The use of local elements, such as sand and water from the Tunuyán River, was prioritized. The human resources and local workforce was also part of the plan. The main building surfaces from the ground exposing the long truncated cone shaped wine vats. These vats are the result of years of experience from the team of enologists. They were made of precast concrete. All the internal area, the surroundings and the equipment were solved with the same material giving it an homogeneous look, where soft strategic light lines fill the walls with a lively and natural brightness. This effect leaves the vats and the space exposed as if it were a cave where the vessels have always been but now, they have only been uncovered. The idea is to transmit that the winery is an extension of the vineyard. Between the structural walls emerges a metallic dome, which represents the universal and the eternal. The dome highlights the special conditions of the place, reflecting the light of the sun and the sky at different times of the day in this mountainous landscape. 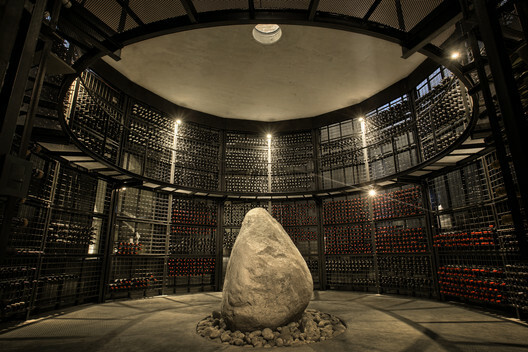 Inside the building, there is a succession of wine storage and wine tasting areas, which represent the passage of times and the projection into the future. Under the dome, a metal work of art, made by Guillermo Rigattieri, is suspended on the air. This work represents the seed, which is the origin and the potential of the future. As you go through the winery, you get to understand the concept and it invites you to discover every corner of it. From the moment you approach the tall and majestic external walls and as you go through the interior and discover the different spaces which show the interplay of light, the changes of temperatures, the silence and the echoes, you feel at awe. All of these features allow the visitor to experience the enological process and get seduced by the attractive and mystic fantasy of the wine making process. Without this experience it is impossible to understand it or feel it. Making wines that respect the identity of the area is a unique activity, which results from a research and development process. It implies a great commitment and passion not only in the vineyards but also in the winery. It is an activity that mainly seeks to understand the place and its unique and unrepeatable characteristics. Science and art together turns into the magic of wine. Following these premises, the design is a mirror to its duality, the technical aspect and the place conjugated with feelings gives us a memorable experience.